Shrewsbury Town have completed the signing of out-of-contract Carlisle United winger Lewis Neal. The 27-year-old former Stoke City trainee has signed a two-year deal with the League Two club. 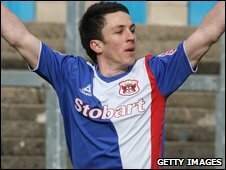 Neal joined Carlisle at the end of January on a six-month deal and played 16 times, scoring twice. Manager Paul Simpson told the club's website: "I believe he is more than capable of playing at a higher level and I hope he does that with us." Shrewsbury winger Chris Humphrey has been linked with a move away from Oteley Road.